Hi there sweet peas. Thank you all so much for your compliments in the hutch makeover project. I am still greeting her with the biggest grin every morning. But today I want to go outside with you. Now I know the weather in these parts is really disappointing, but lets just wait for that one moment each day that the sun comes out and then we’ll sprint into the garden together. I want to show you what I have been up to in my vegetable garden. Now vegetable garden really is overstating it a bit. It is more like a vegetable patch, a mini kitchen garden. Last year I showed you how I created a very neglected corner of my garden into my own square foot vegetable garden. I never mentioned her again. There was a reason for that. I had very mixed results and none of it looked blog worthy. It was part my own fault and part due to the horrible summer we had last year. First I had sort of jumped in with no wisdom, experience or common sense at all. So I made a lot of rookie mistakes. Like being way too late with supporting my tomatoes, not checking often enough for snail activity and not marking what I had seeded where (I thought I could remember, oj!). But even with my total lack of veggie garden skills, we still managed to eat almost all of our salad from the garden. It is a bit of a pain to have to wash your lettuce but the taste and freshness of it, makes up for that in spades. I found growing herbs was easy and the bouquet garni that I created with them added so much taste our cooking that I really wanted to grow more herbs. So I decided that this year I was going to give my little vegetable garden another go. First order of business, install something that will help my tomatoes (and other climbing veggies) to stay up. This is my plant support in my mini square foot garden. In between rain showers (and a bit during) my love and I set up this construction. It was quite easy. We used pipes and corner pieces for central heating installations to form the frame. Inside the frame we attached some leftover fence wire. The frame slides over a metal rod that is pushed into the soil and attached to the outside of the vegetable box. Took us about an hour. Next order of business, make sure I’ll know what I planted where (and help the man when I send him outside to cut some dill for me). I wanted something easy, fun and reusable. I came up with these wooden spoon garden markers. I just used a permanent marker to write down the herb/vegetable on the front and back and then gave them a couple of coats of varnish. Easy, peasy, lemon squeezy. Turned out I hadn’t bought enough spoons so I used some paint sticks too. I used those too for the veggies and herbs I am not quite sure about if they will stay for the long run. And then I took pictures…..
Of the lettuce that I planted in big tubs this year to discourage the snails. Hopefully they won’t want to track up that high. Of my herbs and my spoons and how cute they look together…..
And then I got totally distracted by the chives that are almost blooming. And then I noticed some other beautiful flowers in my garden. 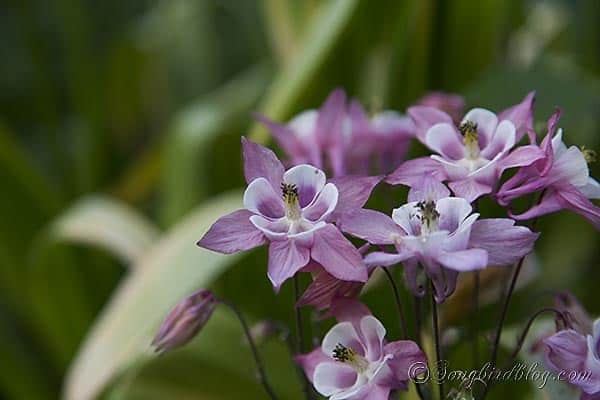 Like these alliums…..
…… I have about five varieties of Columbine in my garden now (totally had to look up that name, cute, in Dutch they are called Akelei). 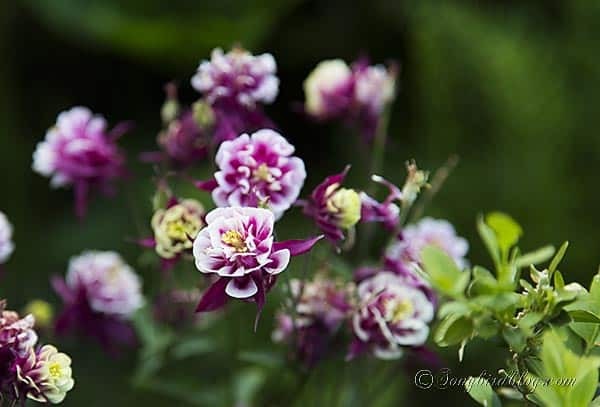 Funny thing about these is that they sort of mix and mingle among themselves and create new varieties themselves each year. Gotta love that. And then there is the promise of fresh berries…..
And my promise to you to come up with some good recipes to use up some of this lovely rhubarb. And that’s it from over here for now…..
Hope you enjoyed strolling in the garden with me. Oh but before I forget the winner of my book giveaway is number 8: Gwen. A message to you is on its way. Congratulations! Great job…looking forward to hearing more! Oh! PS– I wanted to come back and tell you. Next time your broccoli bolts and puts off flowers…let them go! You can pinch them off and give them a rinse and garnish your salad with the flowers too! I just learned that this year. They taste just like broccoli. After that the flowers drop and then the seed pods form and you can harvest the seeds. I love it and those cute garden markers. What a neat idea. I hope to have a kitchen garden soon. In the meantime, I plant herbs in pots. Love the wooden spoon idea! Your garden looks great – I like how you’ve planted in a grid (something I should think about doing in my raised gardens). Have I mentioned how much I admire your photography skills? Great post Marianne! The wooden spoon idea is too cool, may have to borrow that! I’ve been fascinated with the square gardening idea. I bought a book on that years ago, but never got started…I should get going on that! Good luck in keeping the snails away, we have so many of them here too. Maybe planting something just for them is the answer?! I don’t know…just a thought.